the tip is always sharp because it is not re-used. A Fox3 pentagon was used with five stab incisions using no. 11 blade, two in the eyelid, two in the superior eyebrow margin, and one in the forehead. 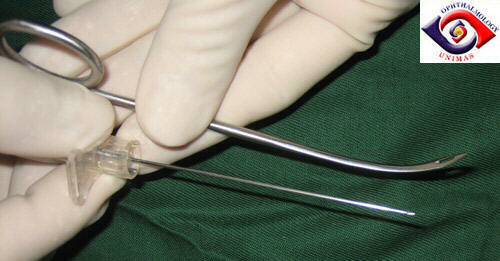 The 18-gauge intravenous catheter needle was inserted through the incision sites. A lid guard was placed between the globe and the eyelid to avoid accidental penetration of the eye by the needle. The sutures were lifted and tied at the forehead incision to achieve the satisfactory lid height and contour. Only the forehead incision needs suturing with 6.0 Vicryl to prevent protrusion of the suture ends. We have used this technique in 15 patients (22 eyelids) with good cosmetic results. needs suturing (K and L). a. What is the disadvantage of this technique? b. What alternative instrument may be used?